When 44-year-old New Yorker Maribeth Klein has a heart attack, she realizes she needs to slow down—but with working full-time and being the mother to preschool-aged twins, she is finding it hard to do. Her husband, Jason, and mother, Evelyn, seem unable to take over most of the tasks of running a household so Maribeth can rest and get better. Fed up, Maribeth, leaves her family and moves to Pittsburgh to recover. Pittsburgh is also the city she was born in, and Maribeth, an adoptee, would like to find her birth mother. Will living there anonymously help her find her way home? 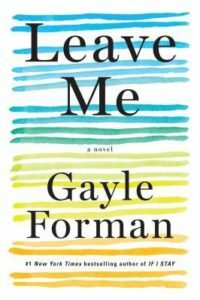 Leave Me is very enjoyable novel full of heart and memorable characters. Gayle Forman’s book is a perfect read-alike for readers of Katherine Center and Mouse-Proof Kitchen by Saira Shah. O Magazine compared the book to Anne Tyler…a good match.